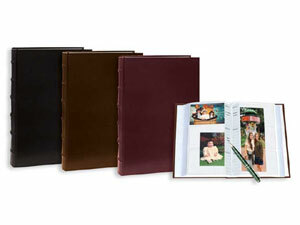 Sewn, European Bonded Leather Bi-Directional Le Memo Pocket Album Pockets hold horizontal or vertical prints up to 4x6. Also holds panoramics. Tri-channel pockets hold horizontal or vertical prints up to 4" x 6"
Also holds panoramics up to 4" x 10"